One of the main innovators of musical modernism, Paul Hindemith (November 16, 1895 - December 28, 1963) was a composer, conductor, violist, educator, and theoretician. Of the four founders of modernism – Arnold Schoenberg, Igor Stravinsky, Béla Bartók, and Hindemith – one can argue that Hindemith was by far the most scholarly and intellectual in temperament. His theoretic interests were both deep and wide-ranging and included medieval philosophy and the writings of the early church, as well as musical topics. He could play all the standard musical instruments at least passably and was a recognized virtuoso on the viola and viola d'amore. A sought-after educator, he taught such composers as Lukas Foss, Arnold Cooke, Franz Reizenstein, and Norman Dello Joio and wielded great influence in Europe and the United States between the two World Wars. Hindemith began composing in a post-Romantic, Reger-like idiom, although Hindemith's textures are generally leaner. During the Twenties, he went through a "shock" phase, turning out work which owed much to white dance-band music (what most Europeans thought of as jazz) in works like the Suite 1922 for piano and had many elements of Expressionism (Der Dämon , Nusch-Nuschi , the Rilke song-cycle Das Marienleben (1923), and the opera Cardillac ). He very quickly moved away from this toward a neoclassicism that owes nothing to Stravinsky. Where Stravinsky worked variations primarily on Mozart, Hindemith looked more to Bach. This is apparent in a series of seven chamber concerti known as the Kammermusiken (1922-1927), some of which pay conscious homage to Bach's Brandenburgs. The music becomes increasingly contrapuntal, and Hindemith begins theoretical researches in a system of harmony based on chords built from fourths, rather than from the usual thirds. By 1930, Hindemith had consolidated his researches and began to produce a series of masterpieces including Concert Music for Strings and Brass (1930), the opera Mathis der Maler (1934-1935), Symphony "Mathis der Maler" (1934) which shares themes with the opera, Plöner Musiktag, Trauermusik (1936), written in less then twenty-four hours, the choral Six Chansons to French poems by Rilke (1939), and the ballet Nobilissima Visione (1938), on the life of St. Francis. He also began a remarkable series of sonatas for every major instrument, all idiomatic and almost all becoming a part of standard repertory. The Nazis forced Hindemith out of Germany. He went to Switzerland, England, and finally settled in the United States, where he joined the Yale University faculty. 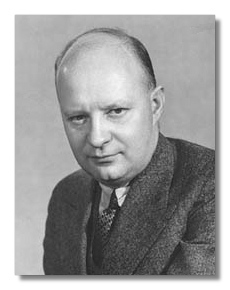 The Forties saw probably the peak of Hindemith's output and critical reputation, with such masterpieces as Symphony in E Flat (1940), Sonata for Two Pianos (1942), Symphonic Metamorphosis on Themes of Carl Maria von Weber (1943), Sinfonia serena (1945), The Four Temperaments (1940), Ludus Tonalis (1942), an homage to Bach's Well-Tempered Clavier, Sonata for Harp (1949), and a magnificent series of concerti for violin, cello, piano, clarinet, and horn. Hindemith wrote concerti for every major instrument. Among the peaks, we also find his choral masterpiece When Lilacs Last in the Dooryard Bloom'd (1946), written on the death of President Roosevelt to the complete Whitman poem. After the war, Hindemith's influence was supplanted by that of Schoenberg and Anton Webern. Hindemith disliked dodecaphony, which he regarded as unnatural, and set himself up as the Anti-Schoenberg. He wrote several satirical pieces using 11-note and 13-note "rows," in a vain attempt to change the direction of musical thought. The later works show no decrease in craft, but there is an anguish to them not found before. He left the United States for Switzerland, his music increasingly ignored, but he nevertheless produced the masterpieces Symphony in B for Band, the organ concerto, Twelve Madrigals, the opera Die Harmonie der Welt and a related symphony, and his last work, a mass for unaccompanied chorus. Ironically, the late works share a similarity of sound with late Schoenberg.